There are 2 slug staging areas at Bobs, primarily going to DC locations. The line close to the gas station next to the bus shelter goes to 18th, 20th and 23rd street. The line away from the gas station goes to 14th street and L'Enfant. There are about 685 parking spaces, it gets full by 7:00 AM. 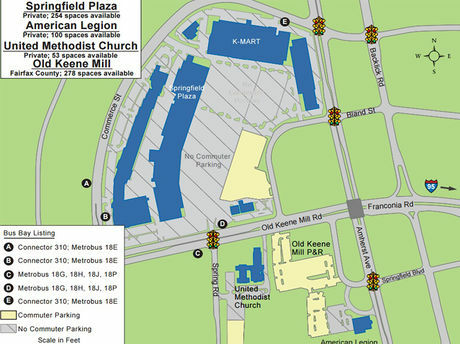 At the shopping complex and American Legion, commuter parking spaces are marked in blue. Bob's is one of the oldest slugging lots, believed to be functioning since 1975 to the Pentagon. It has an easy access to HOV lanes I-95/I-395. This commuter lot has gone through many changes like its names. Bob's lot is also called Old Keene Mill, Springfield Plaza, Springfield Mall, Long John Silvers, Chi Chi's. There is a steady flow of drivers and riders so it moves commuters quickly. Parking lot is present next to K-mart.